"A favourite in any month that does not carry the letter 'R', once again, a typical dish from the north of Belgium and the south of Holland. Usually served with fries and a sourish salad dressing to dip the mussels in. It is a real get-together-in-the-kitchen-dish, as it is usually prepared in 3 or 4 batches every time in the same liquid, which gets better and better." 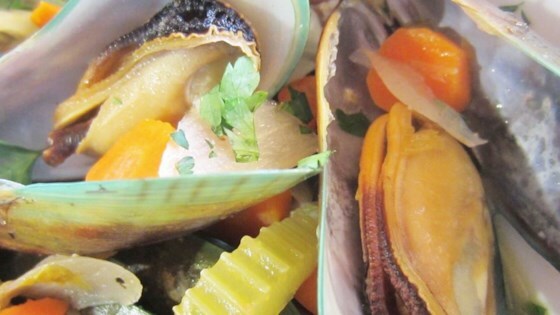 To prepare the mussels, scrape off anything living or growing on the outside of the shells, and pull out the little bunch of dark hairs (the beard) coming out of the side of the shells. Soak them in cold water while doing so. The shells are usually closed when you buy them. Do not panic if they open under water! Any shells that do not close when you tap them, have to be thrown out. This part may be done a couple of hours ahead of time if the mussels are stored in a cool place. Set the cleaned mussels aside. In a large heavy-bottomed pot, combine the carrot, onion, celery, bay leaf, peppercorns, lemon slices and white wine. Bring to a boil over high heat, and add 1/3 of the cleaned mussels. Cover the pan, and cook shaking, every minute or so to help the mussels cook evenly. When all of the mussels are open, remove from the pan using a slotted spoon, and start enjoying your meal. Continue to cook remaining mussels in the same liquid. If you don't want to use wine, you can use the same amount of water, fish stock or light beer. I fell in love with Mussels when I spent a fall in Belgium and this recipe was so delightful and easy. I added 1 small red pepper and 1/2 a portabella mushroom as I had them handy. :).